TraDove is a platform for businesses to be able to communicate and transact with each other, similar to how LinkedIn is a professional network and Facebook is a social network. TraDove will allow corporate buyers and sellers of goods and services on its platform to discover each other more easily, along with the added trust that a user on the TraDove network will have to verify their position as a representative for their business. The highest possible token bonus is 25% for the contribution of hundred thousand US dollars. Average token holder bonus is 20% for contribution prior to the 10th of February. TraDove gives a relatively low bonus and scores quite well in category token economics. The higher the token bonuses the more likely will and ICO done post-ICO during exchange listings this is due too many presale investors selling all of their bonus tokens. Due to human psychology, we perceive tokens that we get for free as worthless and therefore are much more likely to sell them off rather than tokens we paid for. If enough people come to the same conclusion this can have catastrophic effects on the token/coin price post-ICO. There is no lockup period for the bonus tokens. Any unsold tokens will be burned. A lot of pure bonus tokens is preferable over no local as the market has more time increase in value, therefore, TraDove ICO only scores 1.83 for token economics. TraDove is a working business platform with 250,000 users. Social media platforms such as Facebook Twitter and LinkedIn are valued by the amount of data that can be collected from its users as well as the verification of each user. As for Twitter, most users are bots. An average user on TraDove is worth about 105 dollars which makes the platform platforms value around $22.6 million USD. This gives TraDov a huge competitive advantage over most other ICOs. The company scores extremely highly in category team and advisement with a score of 2.6 out of 10 points. The main reason they did not score a perfect 10 is due to the fact, that they outsource most of their Blockchain development Team. Their Blockchain dev team is a very talented group of developers that have been responsible for the latest success of insurance Paul an ICO that did a 4.3X in January. CEO and founder Of TraDov is the former founder and CEO Braincess, an international trade agency. He graduated at MIT with MBA as well a degree in electrical engineering. Another very talented team member is Jian Zheng, director of engineering for TraDove. Mr. Zheng role will be leading the integration of AI and blockchain into the existing TraDove ecosystem. He was previously director of Engineering at Alibaba. The next strong team member is George Cheng responsible for network security, cloud storage, and data analysis. He was sr. IT architect responsible for the now well known Amazon Alexa. Jai Liu previous software Engineer at Facebook is now working for TraDov. Lead Mobile Development. Albert Wang, previous work at LinkedIn as will as cisco. Another great aspect about to go is there web marketing role rocks who is an expert in the field of business to business with more than 10 years of professional experience in web marketing. 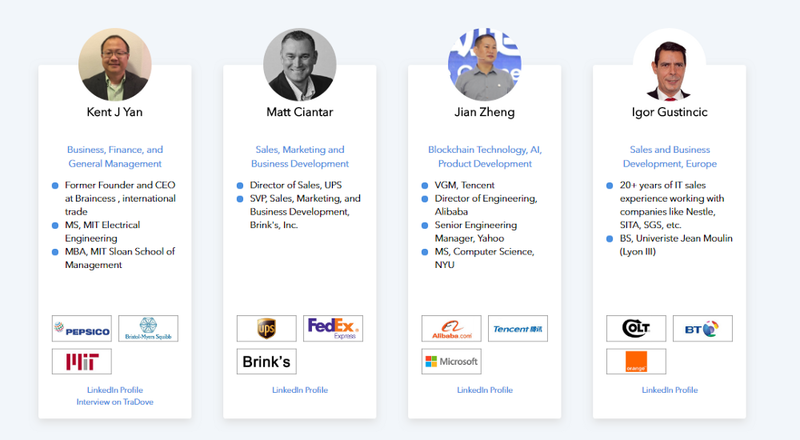 The TraDove team consists of 22 members as well as 18 outsourced Blockchain experts. 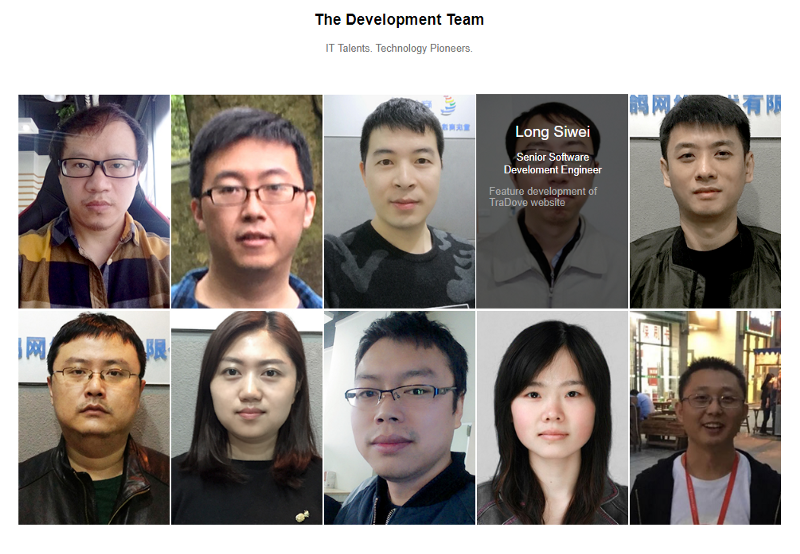 Their personal development team consists of 10 experts. 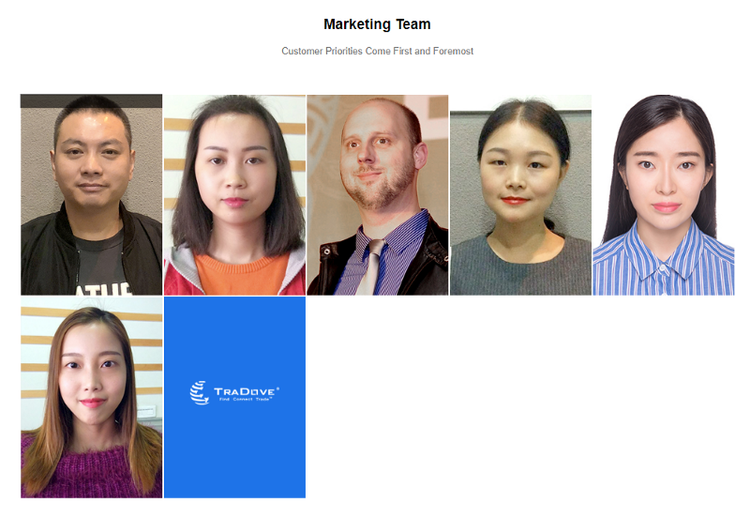 TraDove has a large marketing team which is extremely essential for success in the short run to the long run of any ICO. 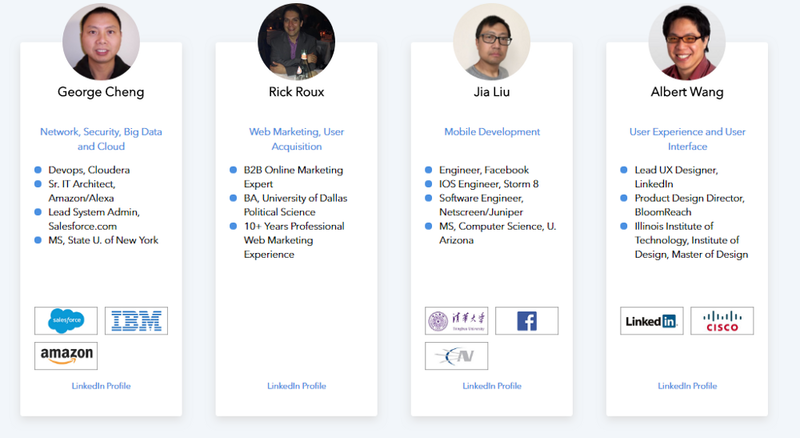 As seen in the past, any ICO with a dream team, but lacking in marketing has failed miserably in the short to mid-term as people want to know what is going on. I suspect TraDove to conqueror the Asian B2B space very quickly due to their rather large Chinese Marketing Team. This will help them to create more hype once they are on an Exchange, however, I am rather disappointed in their current publicity levels. If TraDove manages to gain popularity in the Asian markets with publicity in social media as well as in big news outlets I can see TraDove being tremendously successful in the midterm, however, currently, they have failed to penetrate market acceptance as most Western investors have not heard of TraDov before. I assume this to be largely due to their name. As sad as it is: ICO name is more important then most other Technical stats. TRON, which is in my opinion a complete shitcoin has a Billion dollar evaluation and that mostly because of its sound cool. With over 17 years of experience in the field of digital currencies and blockchain protocols, we possess a unique overview and a rare industry know-how to grow, build and connect global blockchain projects that are ready to take a leap in transforming their industry. Netis Group is also working on the Insurance Pal project, which was a huge success, entering the markets at 300% of ICO price. Tradov has some of the most influential people of the world advising them. The former chairman and CEO of Bank of America Richard Rosenberg, former CFO of Morgan Stanley, former CEO of Siemens care are sure my, as well as former vice president of General Motors. Mike Honda a retired US Congressman also counts to their advisers. TraDove own success in business marketing shows that bear very capable of building a world known business-to-business marketing platform. The TraDove ICO has an incredible reach throughout the entire world due to the positions of their Advisers. I can see similarities to Telcoin which did a 8x in the first week of Exchange Listing. This will give them a great advantage over their current competitor LinkedIn and Dock.io. TraDove has been featured in many large mainstream media outlets, but still lacks in hype in the cryptospace. They lack good advisers that have expertise ICO investments and startup. This can be a rather good thing as most of their current investors are world known influences, that will most likely be holding the coin or the long term. The TraDove ICO scores a total value of 85,41% making it the 5th best ICO of February. Until now most of the tokens were sold during the presale, and not much has happened since. This makes me positive that the ICO will not sell out. All tokens that are not sold will be burned. Copyright © 2018 ICO DOG. All rights reserved. Copyright © 2018 ICO DOG Inc. All rights reserved.